Practical tips to help you get the most out of your garden. Astilbe biternata False goat’s bedard is a herbaceous perennial native to the southern Appalachian Mountains where it grows in moist mountain woodlands, roadsides, ditches, and seepage slopes. It belongs to the saxifrage family, Saxifragaceae, that also includes foamflower (Tiarella), coral bells (Heuchera), and Bergenia. Although it resembles goat’s beard in derives its common name from that characteristic, it is not even in the same plant family. The compound leaves of false goat’s beard are bright green, up to two feet long and is twice divided into three with toothed or lobed oval leaflets and a three lobed terminal leaflet. Male and female small white to off-white flowers are carried in different plants in terminal clusters on hairy branched stalks from late spring to early summer. 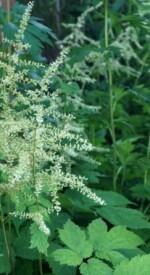 The generic name Astilbe comes from the Greek words a meaning without and stilbe meaning brightness referring to the dull leaves of some species. The specific epithet biternata comes from the Latin words bis meaning twice and ternatus meaning in clusters of three, referring to the compound leaves. Bloom: Small white to off-white flowers in terminal clusters on hairy branched stems in late spring to early summer.